(CBS/AP) SAN FRANCISCO - The suspect in the fatal shooting of a Hells Angels member at a San Jose funeral remained on the run Sunday after a fruitless all-day standoff over the weekend, according to authorities. On Saturday morning, about 30 heavily-armed San Jose police officers, backed up by armored police vehicles, surrounded a home in a residential Stockton neighborhood after getting a tip that Steve Ruiz was hiding out inside. Ruiz, 38, is suspected of killing fellow Hells Angel member Steve Tausan, 52, after a fight broke out at the funeral for the president of the biker gang's San Jose chapter on Oct. 15. Police stormed the Stockton home Saturday evening only to find Ruiz was not inside. San Jose police Sgt. Steve Dwyer would not comment on where investigators thought Ruiz might be heading after the futile search, except to say "we know he has family and associates in Arizona and New York, and now we know he has associates in Stockton as well." "He is still at large and still considered armed and dangerous," Dwyer said. Stockton police spokesman Pete Smith would not comment on whether officers in his department were being asked to continue helping in the search for Ruiz on Sunday. Dwyer said Ruiz is believed to be traveling with his girlfriend, Christel Renee Trujillo, 42, also known as Christel Renee Ferguson. The two are possibly traveling in a gold or pewter Chevrolet Suburban. No year of the vehicle or license plate number was available. 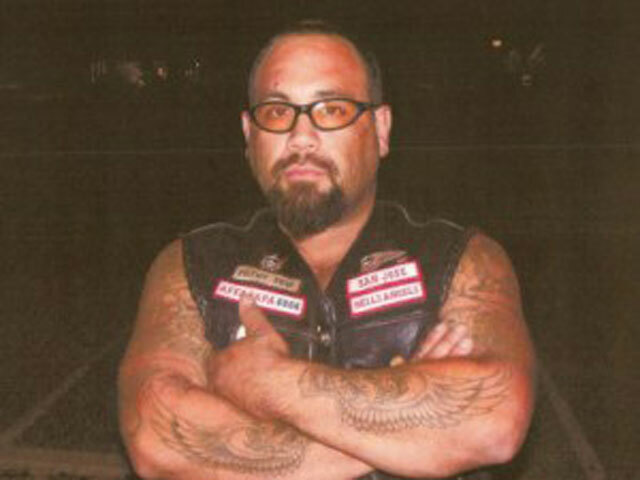 Investigators originally thought that Ruiz may have been killed by other Hells Angels members. However on Friday, they had determined he was still alive. Tausan was one of 4,000 people at the funeral of Jeffrey "Jethro" Pettigrew, leader of the gang's San Jose chapter, who authorities say was slain during a brawl with a rival biker gang in a Nevada casino Sept. 23. Tausan, a former member of the Hells Angels San Jose chapter, was slain despite a heavy police presence at last week's funeral at San Jose's Oak Hill Memorial Park cemetery. San Jose police were monitoring the funeral because of rising tensions among motorcycle gangs.